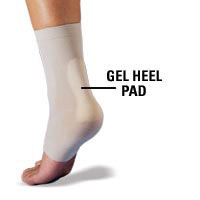 Once you feel the fit of this super-soft, protective gel heel pad, you may not want to take it off. The toeless sleeve moulds to the foot, securing the polymer gel pad at the Achilles tendon to absorb pressure and friction. Amazing relief from Achilles tendonitis, bursitis and other heel maladies. The gel also slowly releases a medical grade mineral oil that softens and moisturizes the skin. Dermatologist tested, hypoallergenic, odourless. Leaves no oil residue on clothing.